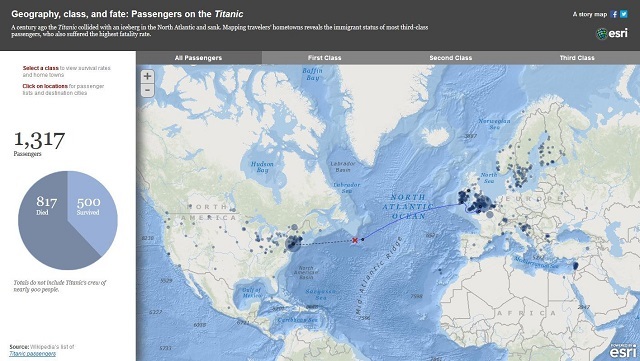 A century ago the Titanic collided with an iceberg in the North Atlantic and sank. This interactive map of travelers’ hometowns reveals the immigrant status of most third-class passengers, who also suffered the highest fatality rate. Click on the image to view the interactive map. 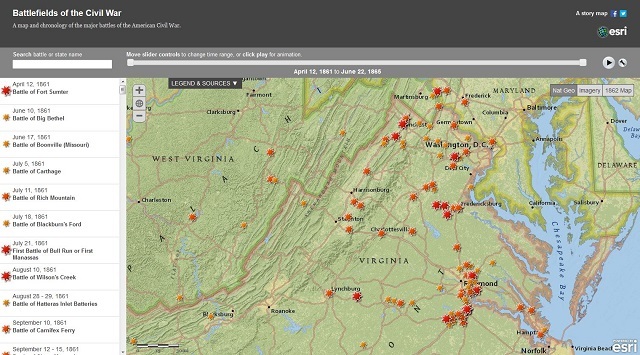 This interactive map and chronology of the major battles of the American Civil War give the conflict a new twist: a geographic perspective. The Battle of Gettysburg was one of the most significant battles of the American Civil War. It involved the largest number of casualties of the entire war and is often described as the war’s turning point. 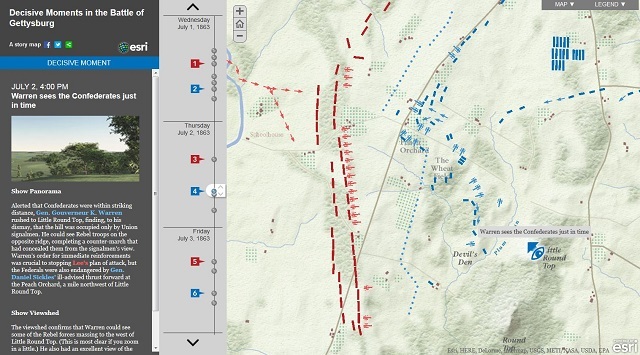 The story in this interactive map is based on Anne Knowles’ research, which uses GIS to examine the viewpoints of Union and Confederate commanders at key points in the Battle of Gettysburg. Abraham Lincoln had dreamt of his own assassination just days before he was attacked at Ford’s Theatre in Washington, DC on April 15th, 1865. 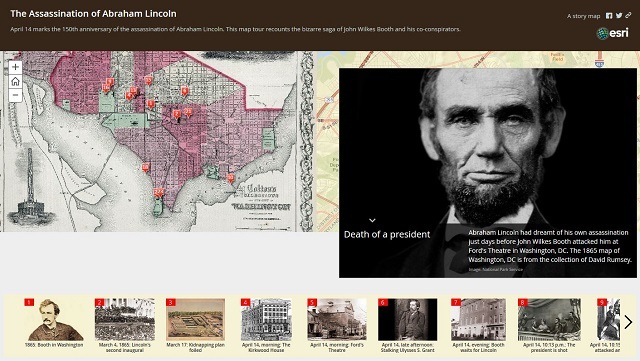 This map tour recounts the bizarre saga of John Wilkes Booth and his co-conspirators. On April 18th, 1906, San Francisco Fire Department Captain Henry Mitchell was on duty working Engine Company #20 when an earthquake struck. Mitchell and his crew worked for three days straight across the city, rescuing victims and fighting fires. 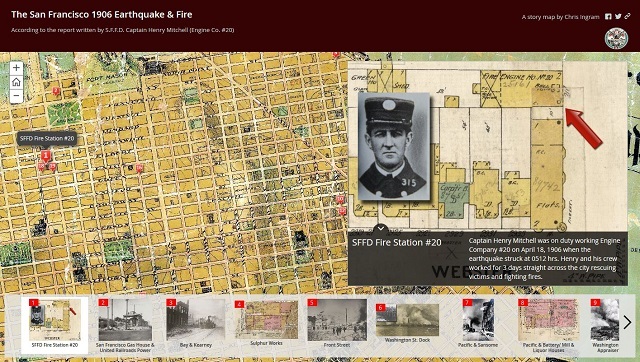 This fascinating interactive map of the 1906 San Francisco earthquake and fire is based on the report written by Mitchell for the San Francisco Fire Department. 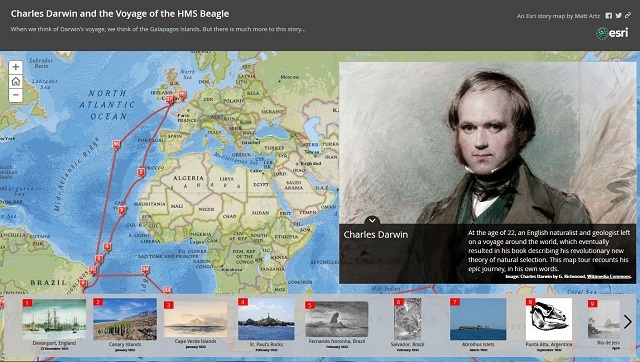 When we think of Darwin’s voyage, we automatically think of the Galapagos Islands. But there is much more to his story. At the age of 22, an English naturalist and geologist left on a voyage around the world, which eventually resulted in his book describing his revolutionary new theory of natural selection. Nearly 200 years later, this map tour recounts his epic journey — in his own words, and using period imagery. 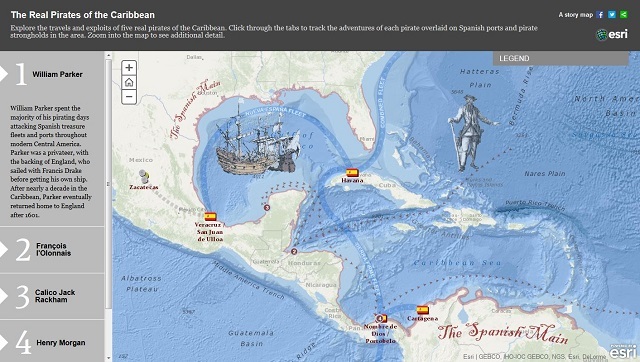 So much more than an entertaining ride at Disneyland, this interactive map lets you explore the travels and exploits of five real pirates of the Caribbean. For example, did you know that Blackbeard’s real name was Edward Teach, and that most of his exploits took place not in the Caribbean, but off the eastern coast of the US? See more story maps about history. Learn more how you can tell your story more effectively with maps.